Born at l’Assomption, Lower Canada on 25 December 1825, the son of Joseph Isaac Ritchot and Marie Riopel, he entered ecclesiastical orders in 1852. He was ordained to the priesthood in 1855. 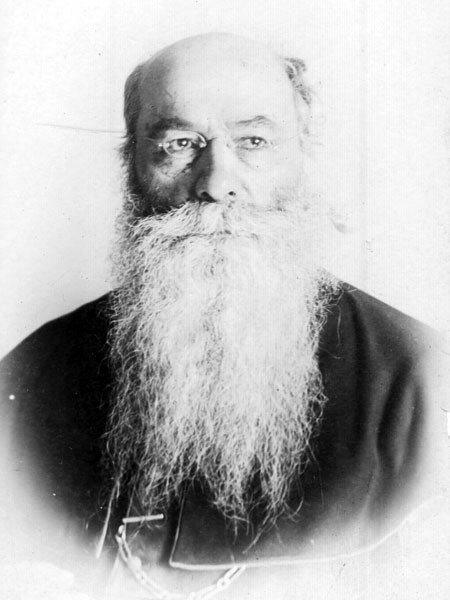 Arriving at the Red River missions on 7 June 1862, he was appointed to the parish of St. Norbert where he served for forty-three years, building a church, a rectory, a convent and an orphanage. He also purchased 1,000 acres on which the Trappists created a model farm. He was created apostolic prothonotary by the Pope in 1897, receiving the pallium on 6 October. This gave him the right to the title of Monseigneur. In 1869 he was actively involved with his parishioners -- some said he was Louis Riel’s chief adviser -- in the opposition to the transfer of the West from the Hudson's Bay Company to Canada, although his role lessened after the establishment of the provisional government in December 1869. He was selected in February 1870 as a delegate of the provisional government (with John Black and Alfred H. Scott) to negotiate an agreement with Canada based upon a “List of Rights” drafted by the Convention of Forty and revised by the executive of the provisional government. He began travelling to Ottawa in late March 1870, arriving in Ontario at about the same time as the news of the death of Thomas Scott. He was briefly arrested on charges of complicity in Scott’s “murder,” but was soon released. Although the Canadian government refused to accept the delegates as officially representing the provisional government, since it did not wish to recognize that government, Sir John A. Macdonald and George-Étienne Cartier did open discussions with Ritchot and his companions. Ritchot took the lead in the negotiations, which led to the passage of the Manitoba Act. Ottawa granted provincial status, bilingualism and biculturalism, and a large amount of land (1,400,000 acres) in compensation for the Métis loss of Aboriginal rights, and privately agreed to a general amnesty for all resisters. The amnesty question would prove a thorny one, since pressure from Ontario made a public announcement of an amnesty impossible. Land claims proved equally difficult to settle. In the end, of Ritchot’s major concerns in 1870, only provincial status really stood the test of time. Ritchot increasingly felt betrayed by the government. He tried desperately to keep his parishioners in Manitoba and eventually accumulated much Métis land in the parish to provide for incoming Francophones. The remainderof his life was devoted to religious and parish duties, and he died at St. Norbert on 16 March 1905. Ritchot’s journal of his negotiations with Ottawa (translated into English) has been published by W. L. Morton in Manitoba: The Birth of a Province (1965), pages 131-60. There are papers at the Archives of Manitoba. He is commemorated by Rue Ritchot in Winnipeg, by a commemorative plaque on the grounds of the Manitoba Legislative Building, and by the Rural Municipality of Ritchot. “Ritchot’s Resistance: Abbé Noel Joseph Ritchot and the Creation and Transformation of Manitoba” by Philippe Mailhot, PhD dissertation, University of Manitoba, 1986). Joseph-Noel Ritchot, Dictionary of Canadian Biography XIII, 876-78.